From the ingenious mind behind Transmetropolitan, Fell, and Planetary (among numerous others), here's one innovative comic book you can't get in your friendly neighborhood comic bookstores. Wednesday brings yet another batches of comic books. With DC and Marvel killing each other silly over Summer big crossover events (DC's Flashpoint and Marvel's Fear Itself), is there something worth looking forward to in your friendly neighborhood comic bookstores? Here's one you won't be getting in the comic bookstores. 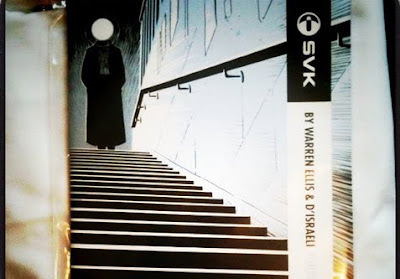 SVK, a 40-page graphic novella written by Warren Ellis and illustrated by Matt "D'Israeli" Brooker, will be available today. Via mail order only. Why? 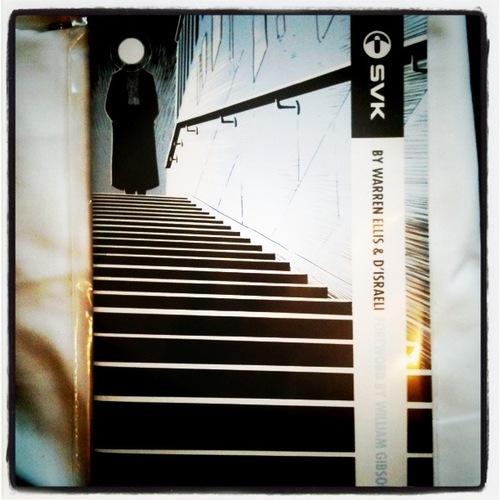 SVK is a 40-page comic book available via mail order only. SVK is an experimental publication, conceived of and produced by the design and invention group BERG. They came to me with the idea and asked me to help them make it work. I drafted in my old friend Matt Brooker, better known to a legion of comics readers as the artist D’Israeli, to illustrate it and help me solve it. SVK comes packaged with a UV torch. Because a lot of it is printed in invisible UV ink, and therefore elements of the book can only be seen by shining the torch on the pages. Why is it only mail order? Because BERG wanted to solve their own supply chain. They want to make more things and sell them themselves. SVK is a test article for that process. They’re publishing it: they decide how to distribute it. Why is it expensive? It’s a short print run, printed in UV ink that they had to pass security tests in order to get their hands on, enclosed with a UV torch with custom printing, and wrapped in custom packaging. This isn’t a standard comic. SVK comes with a foreword by William Gibson, and articles by futures expert Jamais Cascio and comics historian Paul Gravett. SVK was the hardest thing I’ve written in years. I think it’s also the best thing I’ve written in a few years. And, without offense to my other collaborators, I’ve known and worked with Matt for twenty years, and that means that not only does stuff appear on the page exactly as I imagined it would, but that it’ll also be better than I imagined it. At some point, once the book’s circulated a bit, I’ll talk about the horrible technical difficulties Matt solved without breaking step. Suffice it to say that this book very probably would not have happened at all if Matt Brooker had not been onboard. And, finally, I need to thank the whole BERG team, who have worked like demons on SVK. The book itself is only the iceberg tip of the machine they’ve had to build to make this work. Appropriately touching on the topic of a futuristic surveillance state, SVK comes with a black light reader to read dialogue printed in invisible ink. While the book can be order directly at this link and I cheerfully implore any self-respecting comic readers to check out what Ellis called the best thing he have written in years, the shipping fee from England is one hell of a downer. An experimental publication, SVK comprises the SVK object and a comic book. Comics break the rules of storytelling, invent new ones, and break them again – more often than almost any other medium. This graphic novella is about looking – an investigation into perception, storytelling and optical experimentation that inherits some of the curiosities behind the previous work of BERG. 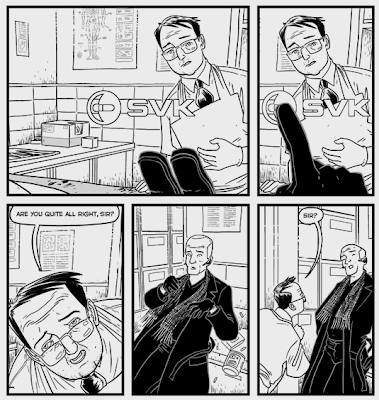 First and foremost SVK is a modern detective story, one that Ellis describes as “Franz Kafka’s Bourne Identity”. It’s a story about cities, technology and surveillance, mixed with human themes of the power, corruption and lies that lurk in the data-smog of our near-future. Head over to the book's official page to preview the innovative concept.